When the title of world's greatest athlete is bestowed upon you, it cannot be easy to stay grounded. 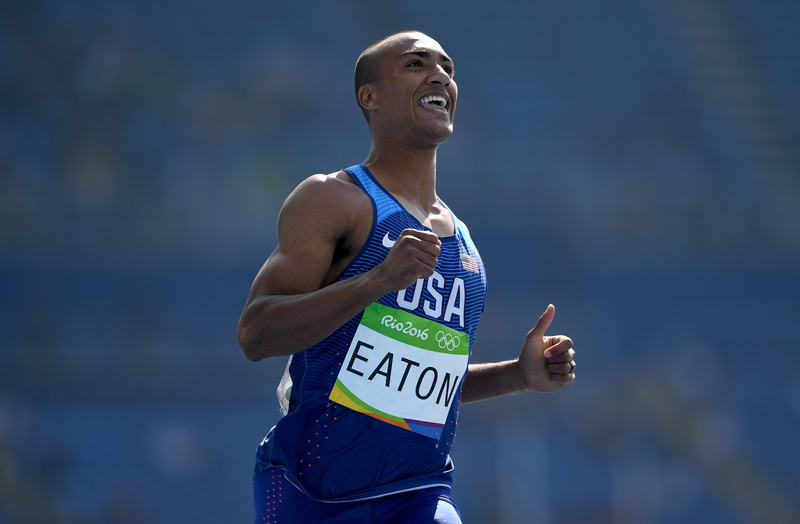 Thankfully, track and field star Ashton Eaton's parents are always there to not only support their son, but also to give him perspective (his equally awesome fellow Olympian and wife Brianne Theisen-Eaton surely helps too). Ashton is the only child of Roslyn Eaton and Terrance Wilson, who separated when Ashton was just two years old. As a result, Ashton was primarily raised by his mother, who also happens to be his biggest fan. Roslyn moved herself and her young son first to a small town in Oregon called La Pine, and later to the slightly larger town of Bend. It was there Roslyn would raise Ashton to follow his passions. In a 2012 interview with ESPN, Roslyn revealed her two rules for Ashton's sports participation: "If you start it, finish it," and "do whatever you're doing 100 percent." As a result, Ashton not only tried out a multitude of sports, he pushed himself to excel at all of them. However, when the time came to narrow down the list of sports he participated in, Roslyn supported her son's decision completely. Throughout Ashton's career, Roslyn has been his biggest supporter. She is the kind of mom who is always in the stands, and when Ashton took home the gold medal in London, his mom was there to celebrate with her son. As much as Ashton's success is about his hard work, it also about all of the choices his mother made to ensure her son could have a beautiful life and the athletic career he wanted. Now that Ashton is a champion Olympian and world record holder who has been dubbed the world's greatest athlete, Roslyn has found herself in a position where other parents are constantly asking her advice. Roslyn hosted a TED talk entitled "How to Raise an Olympian" to share her experience as a single mother of a young athlete with others. During her talk, Roslyn revealed how her own past informed how she raised her son: Roslyn was raised by her grandmother for most of her a childhood, a woman who worked two factory jobs to support her ailing husband and the seven children living in her home, something which taught her to be self-reliant. It also left her scared and uncertain. In her TED Talk Roslyn notes she grew up believing nothing was possible, but it pushed her to instill in her son a belief that everything was possible. It is clear her hard work paid off. Roslyn is and always will be Ashton's greatest fan and biggest supporter, but she is also an eloquent speaker and inspiration in her own right. Her son is a champion, but it is in large part because he had a champion mom guiding him every step of the way.